I was excited to see Sandwich terns today on Swan Island. It is rock outcrop a few yards from Strangford harbour. They are on time! Cold winds are easing and the days are warmer and have longer hours of daylight. Isn’t it wonderful that these birds fly thousands of miles from southern parts of Europe and America to rear their young. We are privileged to have them visit. Thousands of travelers on the Strangford ferry will get to see these terns up close. The birds are safe on the island out of reach from any enemies, but near enough for us to enjoy them. There are many pairs in the colony that will nest and rear their young on the small island. They are very noisy. They rise up into the air together, screech and fly off to feed. They catch small fish on the surface of the water. Perhaps the same flock of terns return year after year. The Strangford ferry is a vantage point to see the terns. Some of the birds stand on the end of the gangway on the ferry as it crosses the Lough. They aren’t shy of humans. When I arrived home I heard Bird Song as the evening sun was setting. I recognized the blackbird’s, robin’s and starling’s call in the chorus. Only a few come to the bird table in the morning. They must be off looking for mates and making their nests in preparation to rear their young. It is safe now to start building. A week ago there was snow on the ground and many birds were feeding at the bird table. The daffodils are sprouting yellow trumpets at last. They were held back by cold temperatures. What a welcome sight of new green shoots and yellow flowers swaying in the breeze, another sign that spring has sprung. God’s glory is seen in his creation. Who tells the tern to leave the warm climes to come north to the best conditions to rear their young? Who causes the grass, flowers and trees to bud and blossom? Who causes the lambs to be born just when it is warm enough for them to survive. Beni Johnson wife of Bill Johnson, head pastor of Bethel in Redding in the USA, has written a book on intercession. It is her story of how God led her to be an intercessor. She has taken many groups all over the USA and the world to pray. I am very excited after reading this paragraph in her book. An example of a thin place is at Bethel in Israel where Jacob had a dream and he saw angels ascending and descending to heaven. Here is the reference from Genesis. “He had a dream in which he saw a stairway resting on the earth, with its top reaching to heaven, and the angels of God were ascending and descending on it. There above it stood the LORD, and he said: “I am the LORD, the God of your father Abraham and the God of Isaac. I will give you and your descendants the land on which you are lying. When Jacob awoke from his sleep, he thought, “Surely the LORD is in this place, and I was not aware of it.” He was afraid and said, “How awesome is this place! This is none other than the house of God; this is the gate of heaven.” Early the next morning Jacob took the stone he had placed under his head and set it up as a pillar and poured oil on top of it. He called that place Bethel, though the city used to be called Luz. and this stone that I have set up as a pillar will be God’s house. In 2015 Brendan and I visited Israel. I had a desire to visit Bethel, the place where Jacob had a dream. It was not on the usual visitor’s sites in Israel. We had to get a local taxi driver to take us there. He brought us to a viewing point at Bethel where Abraham once stood and God showed him all the land before him and promised to give it to him. It was a privilege to stand on that viewing point, where Abraham once stood, and look out to the north, the south, the east and the west and see the land of Israel stretching before me. God’s promise to Abraham is being fulfilled today as God is bringing the people of Israel back to their homeland. Quite near by was a small building. “There is where It is traditionally thought that Jacob had his dream,” the taxi man advised us. When we went over to the building we entered into a small room. The picture included in this blog shows a view to the east from the landmark. In the middle distance is the house where Jacob is said to have had a dream. We prayed and remembered Jacob’s dream. Again I felt blessed to be where Jacob of old rested. We took some photographs. A picture of my husband revealed just his turso. His legs and arms did not show up in the picture. Something supernatural happened in that place. It is still a place where the Angels ascend and descend, I believe, a thin place. I’m privileged to live on the Ards Peninsula in Ireland. The local council haves named it the Ceeative Peninsula. All along the shores of Strangford Lough are the ruins of Christian settlements. Many people lived in the thriving communities living off the produce of the land and sea. Prayers and praise to God would have been offered in these places. They are Thin Places, I believe. Ireland is known as the Land of saints and scholars. Many missionaries have gone out from Ireland to other nations, and still do today. There is a book written telling How the Irish Saved Civilization, By Thomas Cahill. We have a wonderful inheritance in Ireland, yet to be mined. I was looking back at photographs on my iPhone taken in the last six months. Some photos capture the beauty and colors of the sky and sea from where I live on Strangford Lough in Ireland. The beauty all around me revives my body and soul. I am being restored. I am happy to enjoy the changes in the heavens all around, knowing the Creator holds me in his arms. Tonight the time changes in Ireland. The clocks move forward one hour. It is Eastertime 2016. I am thankful to God to be alive, six years on from being diagnosed with fourth stage colon cancer. This Easter weekend we celebrate a world changing event that happened about 2000 years ago. Jesus died a cruel death and was buried in the grave. But he didn’t stay there. He arose from the grave. He now lives at the Father’s right hand interceding for us. By his death he conquered the power of sin and death, and power of the devil over mankind and made a way for us to go to heaven. He is the way, the truth and the life. I know the power of his death on the cross. Isaiah 53 says “By his stripes we are healed.” I received my healing six years ago. Are you weighed down by misfortune, misery and ill health? Look up. Ask the Creator of the universe for help. His son Jesus paid for your freedom from oppression and sickness by the shedding of his Blood. Have faith in God. Portaferry was a busy port many years ago when fuel and goods were transported by ships. It has a natural, sheltered harbour and had easy access to England across the Irish Sea. There were not the road networks we enjoy today, when many goods are transported in lorries. Many ships would have been docked at the port waiting to unload and then restock with local wheat or potatoes. But the big ships do not visit any more. There are some yachts parked in the Marina. The Portaferry Strangford ferry is the biggest vehicle in these parts. I was pleasantly surprised one evening back in July. Brendan and I had just returned from visiting our daughter and her husband in Scotland. I had the pleasure of seeing a luxury liner enter the waters of Strangford Lough and put down anchor in the bay in front of our home. No it was not the Queen Mary or the Queen Elizabeth. It was the Hebridean Princess, a small ship but never the less a luxury one. It caters for fifty people in sheer luxury, according to its website. Out there on the lough the customers will be settling down to fine dining. The ship was visiting Irish waters to let their customers see our green land. It was Gala Week on the lough. Many yachts with their colourful sails were messing about on the water. I looked out and saw many yachts with their sails catching the evening wind. Red, blue, white, small and tall sails. In the middle of the flotilla the Hebridean Princess appears. I wanted to find some information about this ship. Where did it come from? Was it from Scotland, maybe the Hebrides off Scotland. To my delight I discovered the vessel was originally a ferry that traveled between the Scotland mainland and a Scottish Island. It had been bought in 1989 and was restructured to become a cruise ship. 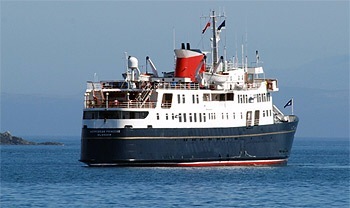 MV Hebridean Princess is a cruise ship operated by Hebridean Island Cruises. She started life as the MacBrayne car ferry and Royal Mail Ship, initially RMS then MV Columba, based in Oban for the first 25 years of her life, carrying up to 600 passengers, and 50 cars, between the Scottish islands. My son in law’s father was the manager of the Caledonian Mac Brayne fleet. He was instrumental in putting into service ferries that would connect the Scottish Islands to the mainland. He did a great job. I appreciate the service our local ferry provides, connecting Portaferry to Strangford. The Caledonian MacBrayne fleet is the largest fleet of car and passenger ferries in the United Kingdom. With 30 units in operation, the company provides lifeline services to 22 islands off the west coast of Scotland, as well as operating routes across the River Clyde. I was touched that I am connected to the history of the cruise ship that came to visit Strangford Lough that day. This post is dedicated to Stuart. Happy Birthday! Daily Prompt. Through the Window. I live in a beautiful place. I live on the Narrows at the entrance to Strangford Lough, the largest sea lough in Ireland. Today the weather is different than many of the days recently. Winds blew and the surface of the water was ruffled. In the distance the sea swell made breaking waves at the mouth of the lough. Yesterday sea and sky were grey. The sea reflected the storm clouds. But today all is well. I look out my window and see still, blue waters that stretch to the mouth of the lough where it joins the Irish Sea. It is unusually quiet. There is no bird song. There are no birds flitting about. They have no need to attract a mate. The young have flown the nest. The Strangford Ferry is out in the middle of the bay. The sound of the Diesel engine is a welcome sound. It breaks the silence. It is faithful to travel back and forth between Portaferry and Stangford. It provides an important service. I do not feel cut off from the rest of the world. One mile down the road I can catch this ferry and It brings me into the world again. For the moment I am enjoying the view out my window. The sea meets the sky in the middle of my panorama. Both are blue today. The morning sun rises. There is a contrast of greens before me. My lawn, which was cut recently, is light green. The mature trees’ leaves are dark green. Their green outline stands out against the blue sky. Red poppies and hosta at the side of my garden welcome the warm sunshine. Our cat sits on the window sill, waiting patiently for her meal. She washs her face with her paw. I don’t feel guilty as I eat my breakfast. The lough seawater slowly rises with the tide and approaches the sea wall at the bottom of my garden. Today there are no crashing waves making the waters approach menacing. A lone yacht is anchored in the bay. There is no sound of the metal tinkling against the mast. I thank God this morning for the view out my window. My eyes are brightened. I am alive to see the goodness of God in the land of the Living.